A two-day course designed to provide theoretical and practical knowledge for professional users intending to view or capture aerial thermal images is announced by iRed. The UK’s first specialist payload course will take place in March at the company's Training Facility in Emsworth, near Portsmouth. The APS (Aerial Payload Specialist) Infrared Course enables delegates to utilise aerial IR equipment to view or collect thermal data in the most effective manner. This is achieved by familiarising attendees with established and proven techniques used in planning and execution of commercial aerial surveys. Delegates are issued with the APS Infrared certificate upon completion of a ground-school multiple-choice exam and a practical flight assessment. There are many aspects to be considered when buying, assembling or operating thermal imaging equipment associated with unmanned aerial vehicles or drones. Subject to weather, the first day is classroom-based. Topics include airframe types, camera selection, pertinent air laws, human factors, environmental conditions, workflow and customer deliverables. On the second day, the practical session will be run from the company's Bosham base, with fully equipped briefing room, workshop and flying facilities. Delegates will have the opportunity to plan, rig, test and execute an aerial thermographic survey. Thermography is a specialist non-invasive technique which uses infrared-sensitive cameras to detect heat-loss – both in terms of location and severity - as part of routine maintenance or fault-finding. Aerial thermography is a rapidly expanding advance which allows for the safe and efficient inspection of hard-to-reach areas. 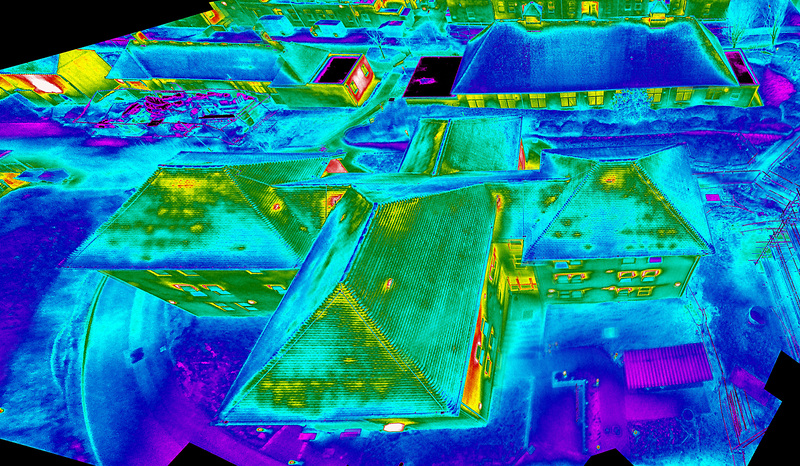 Drones are used to conduct technical inspections using specialist, purpose built thermal imaging cameras that are ideal for surveying roofs, large buildings and wide geographical areas. New ‘gas find’ UAV IR cameras for the oil, gas and utility industries are already in service providing exceptional results in areas previously considered impossible to survey. Unmanned aerial platforms are cost-effective: apart from the financial savings compared to alternative techniques, using a drone often is far safer for engineers relying on rope access or working at height. Founded in 2002, iRed is an industry-leading team of accredited thermographers and pilots based in the UK, providing expert thermal imaging training and consultancy services worldwide. The passionate team has worked with a variety of clients within domestic, commercial, industrial and scientific industries, developing decades of experience and expertise. Using the latest imaging technology and techniques, iRed delivers a wide range of services and accredited training, including condition monitoring, thermographic inspections, reliability engineering support, mould & damp detection, electro-mechanical surveys, continuity of insulation, specialist investigations and BREEAM surveys. iRed is proud to have recently been granted ‘Permissions for Commercial Operations’ by the Civil Aviation Authority (id. 2082), allowing it to utilise Unmanned Aerial Systems (Drones) to provide new, innovative inspection techniques. This press release was distributed by ResponseSource Press Release Wire on behalf of iRed Ltd in the following categories: Environment & Nature, Manufacturing, Engineering & Energy, Construction & Property, for more information visit https://pressreleasewire.responsesource.com/about.